Some people think giving a diaper gift is a bit cheesy. But it is not - it is perfectly okay! And it is extremely useful because every family with a baby is in need of lots and lots of diapers. Of course you can just buy a pack or box of diapers and hand it to the new family, basically there is nothing wrong with this. But why not 'disguise' your diaper packs and make something special out of them so it is not 'just' giving diapers? We show you some cute ways of how to make something special out of a pampers gift! (available for example from Skip Hop, JJ Cole, 3 Sprouts) and fill it up with diapers. Also add a or multiple packs of wipes. Take a colorful burp cloth and place it on top. Then make a bunch of diaper babies and place them on top of your storage bin. How cute is that!? For the diaper babies tutorial click on the image. Take a large bucket - preferably in a pastel color - or an upright bath baby tub and stack your diapers in there. Fill the bottom up with diapers whichever way you like. For your top layer, take a burp cloth and have it hang over the bucket. Then start on the outside and stack the diapers sideways to the walls, in a circle. Work your way to the inside and leave a hole. Roll up one diaper and several others around. Stick this roll of diapers in the middle. Have it poke out a bit like a blossom. To make it more colorful, include a baby scarf or a little burp cloth in the diaper roll for the middle. Alternatively roll a colorful onesie for your middle. 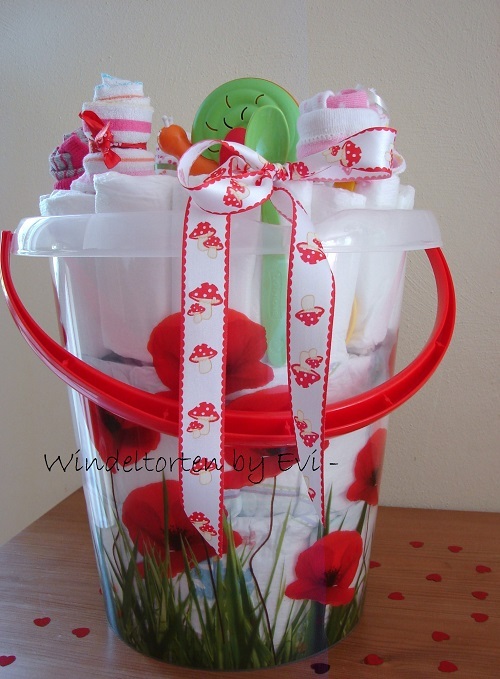 At discretion, finish by tying a large bow around your giant diaper cupcake (the bucket)! This idea is similar to the cupcake one. Take a (green) bucket or a storage container and fill up with diapers. The top layer needs to be vertical and very tight so you can later on stick some baby spoons or artificial flowers in there. You can also roll the diapers up and squeeze the rolls in your container. 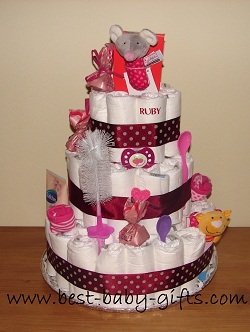 Create a diaper cake, diaper bouquet, diaper snail, diaper owl or any other cute diaper 'creature'. Click on the photos for instructions. 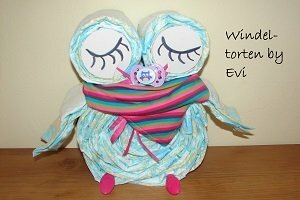 In case you do not know what to do with your left-over diapers, just wrap them up (for example in a burp cloth to make it look like a stork bundle) and give them together with your diaper gift! 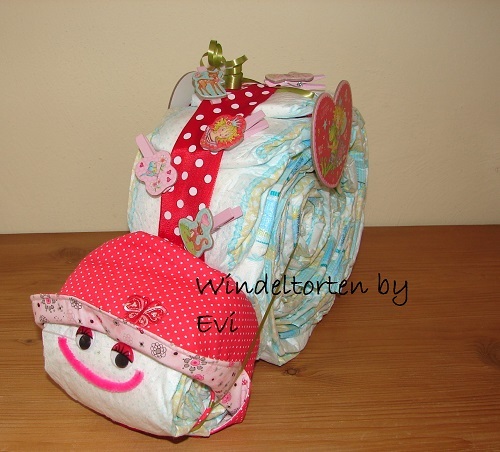 For this cute diaper stork bundle roll up some diapers and fix them with a ribbon. 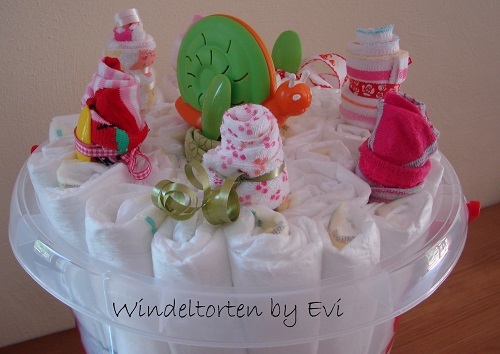 Stack the diapers, wrap them in a burp cloth and attach a baby rattle or baby toy. Some decorative ribbons and bows complete your diaper bundle. Here I have used a Haba clutching toy, called 'Beetle Anton' and the burp cloth has beetles on it, too. The easiest way, is to put a broad ribbon around your diaper pack or box and tie a big bow. Take a pastel blue ribbon for a boy and a pastel pink one for a girl. For a cute decoration, additionally attach some little gadgets like for example a pacifier or some colorful baby spoons. Buy a really large gift bag with a baby design and place your pack(s) in there. 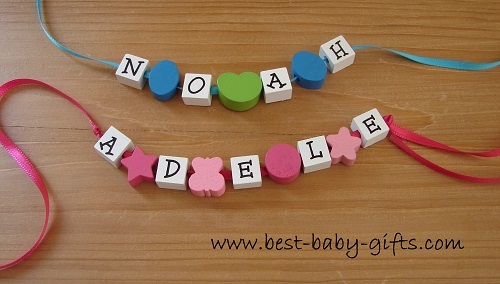 Little wooden letters and colorful beads on a string or satin ribbon are a cute way to personalize your diaper gift. Attach the 'name ribbon' by simply tying knots or with some small cloths pegs. You can also use bigger, self-adhesive (wooden) letters for personalization. Later on the parents can use these to attach to baby's nursery door on to the wall of baby's nursery. 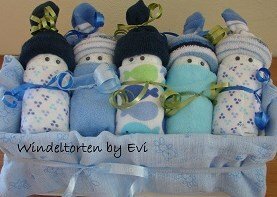 More cute ideas for wrapping a baby shower gift.